Many of the people who come to us for treatment options have been newly diagnosed with a brain tumor. Brain tumors can be are primary or metastatic. 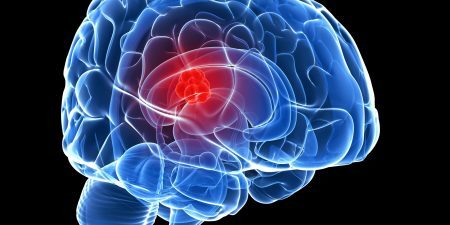 Primary brain tumors are tumors that originate in the brain, and they are made up of brain tissue. In the U.S., primary brain tumors are diagnosed in about 17,000 patients every year, 3,500 of those are in children under the age of 20. Learn more about primary brain tumors. Metastatic tumors are tumors that have occurred because cancer already exists in the body, and it has spread from another organ to the brain. Metastatic tumors are much more common and are found in up 170,000 patients per year. Learn more about metastatic brain tumors. Our patients are often referred to us from other physicians because they have very complex cases. Other times, they may be referred to us so they can be screened for candidacy for one of our clinical trials. And, sometimes, patients discover us on their own. Regardless of how you arrive to the Preston A. Wells Jr. Center for Brain Tumor Therapy, we are glad you are here. Anytime someone is faced with a difficult diagnosis like brain cancer, it is important to understand the facts and to dispel the rumors. Here are some quick facts. 1.4% of newly diagnosed cancers are primary brain tumors. 2.4% of cancer related deaths are caused by brain tumors. Nearly half of all primary brain tumors are gliomas. 80% of gliomas are considered grade three or four. Average age of onset for primary brain tumors is 59. What do we know about glioblastoma? What is the difference between cancer grades and cancer stages? Solid organ cancers like lung, breast, prostate and colon cancers are staged. Staging tells us about the degree of spread. But, since primary brain tumors rarely “spread” outside the brain and spinal cord, they are graded. Grading can tell us how aggressive the cancer is. Grades range from one to four, one being less aggressive, four being most aggressive. Grade one tumors are commonly benign and curable through surgery. However, benign tumors can still be troublesome based on location and operability. Tumors with a grade of three or four are commonly referred to as malignant.